FILE - Family members helps to care for a sick child being treated at the Regional General Hospital (RSUD) in Agats, Asmat District, in the remote region of Papua, Jan. 22, 2018 in this photo taken by Antara Foto. Twin crises of measles and malnutrition have recently afflicted Indonesia’s easternmost province, Papua, inciting foreign and media scrutiny as well as internal review from the Indonesian government. Papua is an impoverished but mineral-rich province with a history of separatist struggle, which has been quashed for decades by the Indonesian military. This week, the nation’s health ministry declared both crises to be under control, but 72 people have already died in Asmat regency. In wake of the outbreaks, finance minister Sri Mulyani said that special autonomy funding for the province would be reevaluated. Per a 2001 law, the sometimes-contested provinces of Aceh, Papua, and West Papua were authorized to receive twenty years of special funding from the national budget. But Mulyani said the public health issues showed that the money was not being used well. “This is a lesson for us, because throughout this time the special autonomy funds have been disbursed as a block grant to the provincial government — even though special autonomy has specific purposes,” she said last week. FILE - Indonesian soldiers along with a local resident unload food and medical aid in Ewer, Asmat District, in the remote region of Papua, Indonesia, Jan. 29, 2018 in this photo taken by Antara Foto. Measles is preventable with a vaccine, and is actually covered by Indonesia’s national vaccination program for children. So the afflicted children in Asmat constitute an oversight. About 650 children there still have measles and at least 223 suffer from malnutrition according to the health ministry website. Papua has long lagged behind Indonesia on nearly every public health valence, with the country’s lowest life expectancy and highest infant, child, and maternal mortality rates. Social issues in Papua are doubly hard to address because of constrained press freedom there. Last week, a BBC reporter, Rebecca Henschke, who went to report from Asmat, was detained by the military and local immigration after she tweeted photos of the food aid being delivered to malnourished children: biscuits, instant noodles. The military claimed the tweets were inaccurate and after being subjected to two days of questioning, Henschke and her team decided to return to Jakarta. 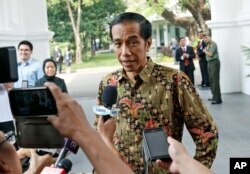 Indonesian President Joko “Jokowi” Widodo announced when he came to office that journalists should feel free to travel to and report from Papua, but in practice, the likelihood of harassment and surveillance like the Henschke incident remain high. The finance minister’s statement indicates publicity from the widely declaimed crises may have potential to harness public opinion to effect changes in Papua. FILE - Sick children are treated by health workers at a hospital in Agats, Asmat District, after the government dispatched military and medical personnel to the remote region of Papua to combat malnutrition and measles, Jan. 22, 2018. There are many structural issues with public health in the province, like a critical shortage of doctors in Asmat since the regency was established 15 years ago. But addressing such issues has taken a backseat to controlling protests and riots, particularly around the mines run by the American corporation Freeport-Mcmoran. The company runs the world’s largest gold mine, Grasberg, near Timika regency, and its work sites have attracted unrest since Indonesia announced plans to nationalize its resources last year. Just last week, Indonesian police fatally shot a 61-year-old woman in Mimika near a Freeport-Mcmoran cargo dock. Thus if any improvements to social services are made going forward, they will have to accommodate such a highly charged political climate.